The interaction between people and the ocean—particularly the coastal ocean—allows for instances in which the ocean and its inhabitants can have negative effects on human health. The greatest biological risk posed to people is from eating tainted seafood, although other factors also can harm humans: for example, the discharge into waterways of organic and inorganic wastes, including toxic substances; the global transport of microorganisms by shipping; and marine animals that bite or sting. Physical processes affecting human health include rough seas that threaten both small and large vessels; weather disturbances such as typhoons and hurricanes; rogue waves; and surges from storms and tsunamis . On a positive note, the ocean may provide medical benefits: pharmaceutical companies collect aquatic organisms with the goal of creating new drugs that prevent or cure disease. Additionally, when people visit the ocean for tourism or recreation, there are positive effects on local economies and on human well-being. Even more significantly, marine phytoplankton conduct about half of the Earth's photosynthesis, producing oxygen and drawing down carbon dioxide. Phytoplankton form the basis of most oceanic food webs , thereby providing the food that is ultimately transferred up food chains to fish and shellfish. One cause of ocean-mediated illness in humans is harmful algae. Of the five thousand species of phytoplankton, about three hundred species can form "blooms" with concentrations high enough to color the water, creating the so-called "red tides" and "brown tides." At least ninety of the bloom-forming species are harmful to humans or animals, particularly through their ability to produce biotoxins. When filter feeders are present during toxic algal blooms, they can concentrate algal toxins in their tissues. When people eat the fish or shell-fish containing these toxins, they may develop illnesses that affect the nervous system or the stomach and intestine. Roughly two thousand cases of human poisoning are recorded globally each year from eating fish and shell-fish contaminated with algal toxins, resulting in about three hundred deaths per year. From the 1970s to present, there has been an apparent increase in the number, intensity, and global distribution of harmful algal blooms. This phenomenon is likely the result of multiple factors, including increased data reporting. For example, a heightened awareness among the public and scientific community has led to increased and more accurate monitoring of coastal algal blooms. The number of harmful algal blooms reported in the United States increased from two hundred per year in the 1970s to seven hundred per year in the 1990s. Another hypothesis for the increase in harmful algal blooms stems from the overabundance of nutrients flowing into coastal waters. Varied sources contribute to the nutrient excess: discharges from sewage treatment plants; untreated sewage; runoff from farmland and overfertilized lawns; air emissions from factories and automobiles that ultimately are entrained in precipitation; loss of wetlands that take up nutrients; and poor erosion control. This human-induced overenrichment may favor harmful algal species that better use these nutrients than their nontoxic counterparts. Food from the sea provides nourishment for human populations. Yet seafood contaminated with natural biotoxins, human-made chemicals, or sewage-related microbes poses a risk to human health. Developed countries generally have safeguards that minimize risks, whereas developing countries may struggle with inadequate public health resources. long timescales, from decades to centuries. Subsequently, some toxins have been incorporated into aquatic plants and animals. Since the environmental movement coalesced in the 1970s, the industrial discharge of pollutants has received considerable attention, and many harmful pollutants have been reduced or eliminated from point-source discharges at factories. Nonetheless, some toxins have long residence times—persisting in the environment for decades—and remain at dangerously high levels in the food web and sediments. Consequently, unacceptably high concentrations of toxic substances are found in fish and shellfish tissues in many waterways. Local authorities thus set restrictions on harvesting and limits on consumption of tainted seafood, especially for children and pregnant women. In countries without sewage treatment facilities, untreated sewage is released into coastal waters. Also, raw sewage may reach coastal waters when water runoff from big storms causes sewage treatment plants to bypass treatment. Finally, some human viruses and bacteria are resistant to chlorination at sewage treatment plants, and they are discharged with the treated effluent into nearby waterbodies. Filter-feeding animals, such as oysters and clams, can concentrate pathogens , such as hepatitis A and Norwalk virus, found in sewage. 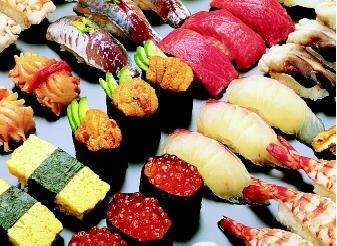 The pathogens then can be transmitted to people when shellfish, especially if un-cooked, are eaten. Shellfish beds downstream from sewage treatment plants often are closed after storms until pathogens are naturally released from the shellfish. In a more straightforward route of infection, illness can also occur by direct contact with contaminated water containing viral, bacterial, or protozoan pathogens. 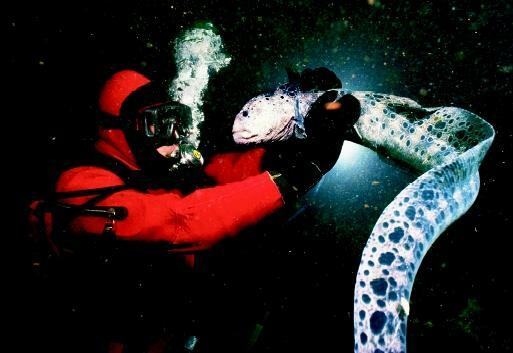 This diver comes face-to-face with a wolf eel, which can inflict a painful bite. Biting and stinging animals in the ocean can cause human injuries ranging from mild to severe, and in rare cases, life-threatening. use water for ballast by loading water aboard in one coastal port and discharging it at successive ports of call. Ballast water consequently contains everything that is in coastal water—viruses, bacteria, protozoa, phytoplankton, zooplankton , and fish. Some of these organisms can colonize new areas where the ballast water is discharged. Ships can globally transport pathogenic microorganisms in ballast water. Many microorganisms have survival strategies, such as the formation of cysts, which enable them to withstand periods of inhospitable conditions. Cysts are an aquatic version of tree seeds that, in this specific case, allow microorganisms to survive confinement in darkened ballast-water tanks. Cysts of many species of toxic algae have been found in ballast water and in sediments in ballast-water tanks. The bacterium that causes the human disease cholera can be transported in ballast water. Circumstantial evidence suggests that a previously unreported strain of cholera found in oysters and fish-gut contents in Mobile Bay, Alabama during 1991, was transported there by ballast water from ships that arrived from Latin America, which had an ongoing cholera epidemic. Although no cases of cholera were reported in Alabama, ballast-water samples collected later contained the epidemic-causing strain of cholera, and this incident highlighted the capability of ballast water to transport pathogens. Some of the most common stinging marine animals are found in the phylum Cnidaria, which includes the jellyfish, sea nettles, sea anemones, corals, and hydras. The Cnidarians' stinging cells are used to capture prey, and humans can inadvertently be stung as well. The stings from most species are only irritating, but a few animals, including the Portuguese man-of-war ( Physalia physalis ), can cause life-threatening reactions among people who are sensitive to the venom or have an allergic reaction to a sting. Also dangerous is the sea itself. Hundreds of people drown in the oceans every year while swimming, surfing, boating, or fishing. Coastal flooding caused by hurricanes and other events is an ever-present threat to human health and property. One particularly dangerous aspect of ocean storms is the storm surge. This relatively sudden rise of normal sea level occurs when storm winds and tides combine to transport large volumes of water to coastal areas. Storm surges have been particularly lethal in low-lying river deltas, which often are heavily populated. For example, in 1900, a 6-meter (20-foot) storm surge and hurricane-force winds combined to kill at least 5,000 people in Galveston, Texas. Ocean currents are a major engine for driving the Earth's climate, and changes in currents can alter climates throughout the world. El Niño is a particularly important disruption in the ocean–atmosphere system. During normal conditions, trade winds blow to the west across the tropical Pacific Ocean, piling up warm surface water in the western Pacific, and cold, deeper water rises up, or upwells, off the west coast of South America. This cold water is rich with nutrients, and it supports a phytoplankton community, which, in turn, is grazed by anchovies. A slackening of the trade winds, called an El Niño event, results in warmer water on the western side of the Pacific basin spreading to the eastern side of the basin. Thus, off South America, cold water is not brought to the surface as efficiently by upwelling. This phenomenon can lead to a decreased catch of anchovies off the South American coast, flooding in Peru, increased rainfall across the southern part of the United States, and droughts in the southwestern Pacific. In addition to havoc caused by floods and mudslides, El Niño can cause secondary effects; for example, El Niño was implicated in increased cases of cholera in Peru in 1991 and 1998. Understanding and predicting El Niño phenomena is a major goal of climate researchers as well as public health authorities and disaster relief organizations worldwide. 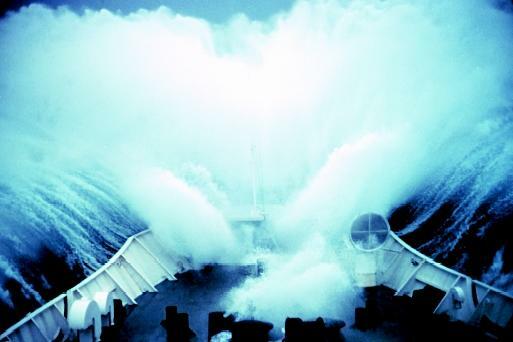 Rough seas pose a danger to commercial ships, fishing boats, research ships, and other oceangoing vessels. This National Oceanic and Atmospheric Administration research vessel encounters huge waves in the Bering Sea. may come expansions in the ranges of marine organisms, leading to a possible increase in human illness. However, citizens and governments are increasingly aware of the impact that humans have on the global environment. One can hope that human populations become better custodians of the ocean and coastal waters in the future by, for example, reducing the flow of toxic substances and excess nutrients to coastal waters. SEE ALSO Algal Blooms, Harmful ; Bivalves ; Cephalopods ; Climate and the Ocean ; Crustaceans ; El NiÑo and La NiÑa ; Fish ; Fisheries, Marine ; Fishes, Cartilaginous ; Food From the Sea ; Global Warming and the Ocean ; Human Health and Water ; Mariculture ; Marine Mammals ; Microbes in the Ocean ; Ocean Currents ; Plankton ; Pollution by Invasive Species ; ; Pollution of the Ocean by Sewage ; Reptiles ; Tsunamis ; Waves ; Weather and the Ocean . Bowers, Holly A. et al. Development of Real-Time PCR Assays for Rapid Detection of Pfiesteria piscicida and Related Dinoflagellates. Applied and Environmental Microbiology 66 (2000):4641–4648. Carlton, James T. "Transoceanic and Interoceanic Dispersal of Coastal Marine Organisms: The Biology of Ballast Water." Oceanography and Marine Biology Annual Review 23 (1985):313–371. Hallegraeff, Gustaaf M. "A Review of Harmful Algal Blooms and Their Apparent Global Increase." Phycologia 32 (1993):79–99. Laws, Edward A. Aquatic Pollution: An Introductory Text. New York: John Wiley & Sons, Inc., 2000. McCarthy Susan A., and Farukh M. Khambaty. "Internal Dissemination of Epidemic Vibrio cholerae by Cargo Ship Ballast and Other Nonpotable Waters." Applied Environmental Microbiology 60 (1994):2597–2601. National Academy Press. From Monsoons to Microbes: Understanding the Ocean's Role in Human Health. Washington, D.C.: National Academy Press, 1999. Patz, Jonathan A. et al. "Global Climate Change and Emerging Infectious Diseases". Journal of the American Medical Association 275 (1996):217–223. Ruiz, Greg M. et al. "Global Spread of Microorganisms by Ships". Nature 408 (2000):49–50. Fish Health in the Chesapeake Bay—Harmful Algal Blooms. University System of Maryland. <http://aquaticpath.umd.edu/toxalg/psp.html> . Marine Poisons: Life and Death. Florida Marine Research Institute. <http://www.floridamarine.org/features> . NOAA El Niño Page. National Oceanic and Atmospheric Administration. <http://www.elnino.noaa.gov/> . Natural products from marine plants and animals are used to treat various human ailments. Some seaweeds contain natural compounds that are detrimental to microorganisms and macro-organisms. For example, an acid in the brown seaweed Digenia is used to control tapeworm, whip-worm, and roundworm. Surprisingly, marine poisons may be beneficial if they are administered properly. Poison from puffer-fish (whose consumption kills scores of people annually) is given as a painkiller to terminal cancer patients in Japan. Likewise, poison from an electric eel may be an antidote for pesticide poisoning. Other potential drug sources from the sea are being researched. Several closely related species of the dinoflagellate Alexandrium are found on the east and west coasts of North America and elsewhere. This tiny algae produces neurotoxins that cause paralytic shellfish poisoning: these substances are among the most toxic marine poisons known. Not only do the toxins become concentrated in filter-feeding shellfish, but they can also accumulate in many parts of the marine food web, including in marine birds and mammals. * See "Life in Water" for a photograph of sea nettles, and "Fish, Cartilaginous" for a photograph of a shark. Thank you for all your concerns and help!